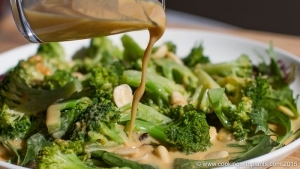 Broccoli Salad with Orange Tahini DressingThis tasty broccoli salad is taken to a whole new level thanks to the orange tahini dressing. Such a delicious salad dressing that is quick and easy to makes and will make your taste buds party! 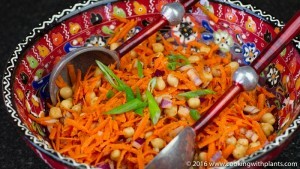 Cajun Chickpea & Carrot SaladThis delicious Cajun Chickpea and Carrot Salad packs a flavor punch and is so fresh and tasty. Great on its own or as a side to fries, vegan burgers etc. Creamy German Potato SaladThis Creamy German Potato Salad recipe is super tasty, easy to make and 100% vegan! 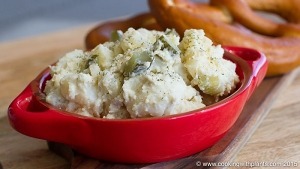 If you have a dairy allergy or are eating a whole food plant based diet, then you will be happy to eat this 🙂 No cholesterol and full of flavor, you won't even believe that this delicious creamy potato salad is healthy. 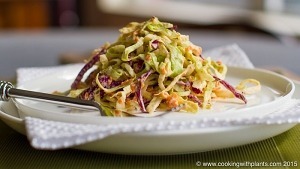 Creamy Vegan ColeslawThis is the best ever creamy vegan coleslaw! 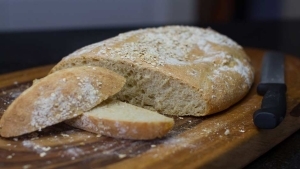 So quick and easy to make, and it's dairy free and has no added oil. Healthy and tasty - and whole food plant based... YUM! This is one of my favorite vegan recipes and is great as a side or to have as a meal by itself. 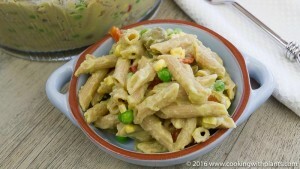 Creamy Vegan Pasta SaladThis is a quick and easy creamy pasta salad that is bright and colorful and a great idea to serve for Easter lunch.